The Church of St. Ignatius Loyola was founded in 1851 as the Church of St. Lawrence O'Toole. Its first building, of Romanesque design, was built in 1854 on East 84th Street between Fourth (Park) and Fifth Avenues. In 1866, administration of the church was passed to the Society of Jesus (Jesuits). Three decades later, construction began on a new Gothic Revival church at the present location on Park Avenue, but only the lower church was completed in 1884. 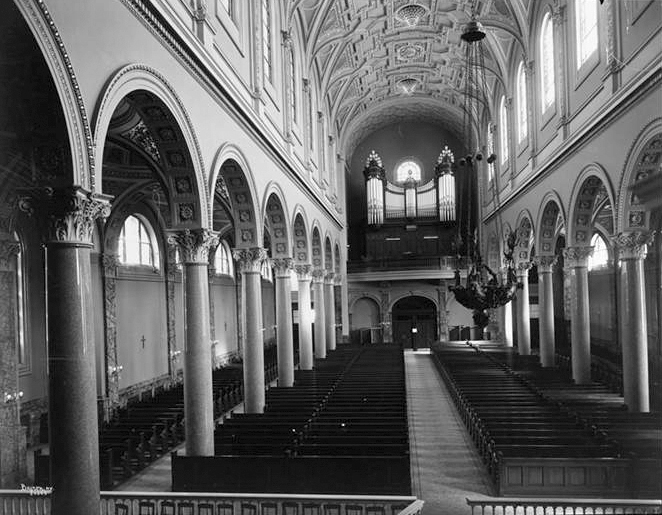 Plans for the upper church were changed to an Italian Renaissance-style basillica as designed by Schickel & Ditmars. The twin towers were to have four-tiered steeples, but this plan was never realized. Upon the completion of the new upper church in 1898, the Jesuits petitioned to have their founder, St. Ignatius Loyola, added as a co-patron of the parish. In 1969, the church was designated by the New York City Landmarks Preservation Commission. St. Ignatius Loyola owns a continuo built by Klop Orgelbouw of The Netherlands. Specifications of this organ have not yet been obtained. Since its installation in 1993, the organ in St. Ignatius Loyola Church has become a landmark liturgical and concert instrument in New York City. Built by Mander Organs of London in 1992, the four-manual organ contains sixty-eight speaking stops, nearly five thousand pipes, and weighs over twenty tons; it is believed to be amongst the largest mechanical action organs ever built in the British Isles. The organ was conceived with strong leanings towards the French symphonic style, and has been acclaimed as one of North America's most significant pipe organs. The organ case, one of the most spectacular to be built in modern times, rises 44 feet above the gallery floor and is made of solid French oak. A facade of polished tin pipes masks the pipes and mechanical action of the instrument, all made easily accessible by wide walkways and stairs. Stephen Bicknell designed the organ, assisted by Didier Grassin, Geoff MacMahon, and James Richardson-Jones. Didier Grassin also designed the case. The organ was voiced by David Frostick and Michael Blighton, and tonal finishing on site was carried out by John Pike Mander and Michael Blighton. In 1975, the Hook & Hastings organ was replaced by a Rodgers electronic instrument which was augmented by thirteen ranks of pipes provided by Fratelli Ruffatti of Padua, Italy. The speakers and pipes of the "combo" organ were installed behind the existing organ cases, and were controlled by two three-manual consoles. Virgil Fox dedicated the organ. Specifications for this organ have not yet been located. In 1913, Hook & Hastings returned to enlarge the 1896 organ from 51 to 80 registers. The existing organ case, which had been centered in the gallery, was divided and installed on either side of a new stained glass window. Sometime before 1950, William W. Laws rebuilt (or possibly replaced) the organ so that it had 3 manuals, 44 stops and 2757 pipes. The older "basement" Church of St. Lawrence O'Toole was completed in 1884, and probably included an organ when it was opened. Available records have not revealed details of such an organ, but in 1912 the Hook & Hastings Company installed a two-manual-and-pedal organ in the "St. Lawrence Chapel" of the church. Sometime before 1950, William W. Laws rebuilt or replaced the organ to have two manuals, eleven stops and 572 pipes. Specifications for these organs have not yet been located. The original organ for the newly completed upper church was built in 1896 by Hook & Hastings of Boston. Specifications for this organ have not yet been located. The original church, known as St. Lawrence O'Toole, had an organ built in 1847 by Henry Erben of New York City. As the church was not founded until 1854, this was undoubtedly a second-hand organ. Specifications for this organ have not yet been located. Dolkart, Andrew S. and Matthew A. Postal. Guide to New York City Landmarks. Hoboken: John Wiley & Sons, Inc., 2004. Van Pelt, William T. The Hook Opus List, 1829-1916 in Facsimile. Richmond: The Organ Historical Society, 1991. Byron Company (New York, N.Y.). 1899 photo of Hook & Hastings organ, Op. 1710 (1896). Church of St. Ignatius Loyola website. Exterior. Lawson, Steven E. Interior, Mander Organ case and console. Mander Organs. Mander Organ console. Wurts Bros. (New York, N.Y.). ca. 1915 photo of Hook & Hastings organ, Op. 2326 (1913).